MagiTime For most of today's digital cameras the photos are saved in JPG files. The date and time at which a photo is taken are stored along with the image in so called EXIF format. Such date and time information can be viewed on a PC once the JPG files are transferred from the digital camera to the PC. When you make a hardcopy of a digital photo by using a color printer or by sending it to a photo lab, the date and time do not get printed on the hardcopy photo. 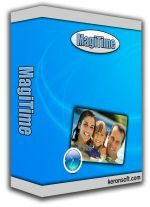 By using Magitime, the date and time are extracted from the JPG files and superimposed onto the photos. This way when a hardcopy is made from the JPG file, the date and/or time will show up on the photo. iMpeg Converter - AVI to VCD, AVI to DVD and AVI to SVCD video converter.